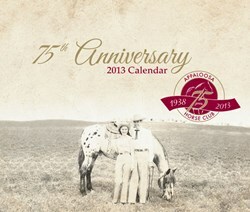 Appaloosa Journal prevails in elite APEX competition with its 2013 commemorative calendar chronicling the 75th anniversary of the Appaloosa Horse Club. “We are honored to be recognized by APEX,” said Steve Taylor, ApHC CEO. “The history and lineages of the Appaloosa breed have never before been compiled in the way the commemorative calendar does. It is a true keepsake." 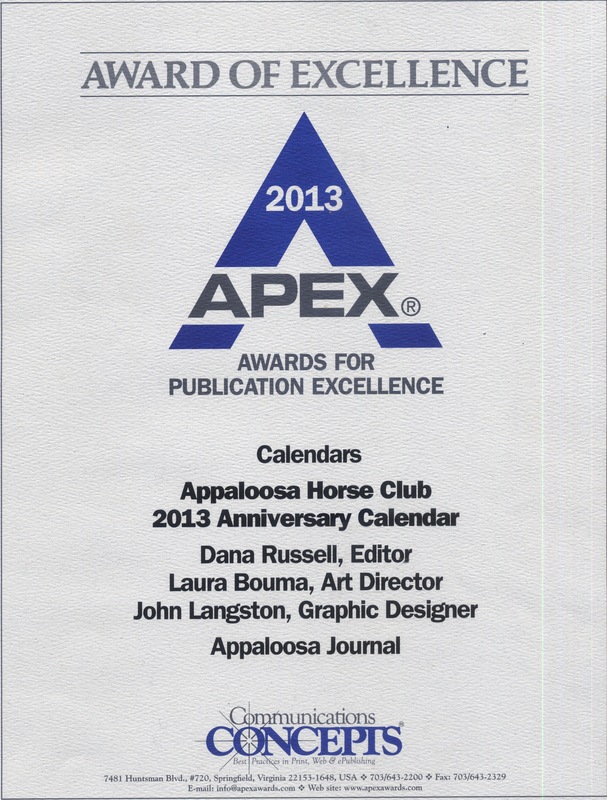 The Appaloosa Journal team announced today that it has been honored with a 2013 APEX Award for Publication Excellence for its once-in-a-lifetime 2013 calendar commemorating the 75th anniversary of the Appaloosa Horse Club (ApHC). The international APEX awards competition recognizes outstanding editors, publication staff, and business and non-profit communicators in the areas of editorial content, graphic design, and overall success in communications effectiveness and excellence. Winning among 237 Design & Illustration submissions, the unique 13-month calendar beautifully chronicles 75 years of Hall of Fame lineages and major timeline events of the ApHC. Lush with its large format and aqueous finish, each month features Appaloosa Hall of Fame horses that are related to each other—including both rare and iconic photos—illustrating the beauty and power of 13 of the breed’s most successful bloodlines. Now in its 25th year, the APEX competition is sponsored by Communications Concepts, Inc., which advises publishing, PR and marketing professionals on best practices in print, web and publishing. Appaloosa Journal is the authoritative, association-based source for information about the Appaloosa Horse Club, the Appaloosa breed and the Appaloosa industry. Our mission is to cultivate a broader membership base and instill enthusiasm for the breed by recognizing the needs and the achievements of the Appaloosa, ApHC members, enthusiasts and our readers.